ROME, Italy (CNN) -- Pope Benedict XVI had surgery on his right wrist Friday after he broke it in a fall, the Vatican said. 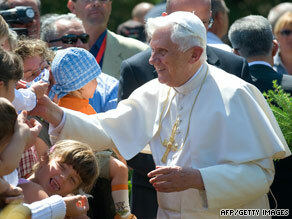 Pope Benedict XVI arrives at a resort in northern Italy's Val d'Aosta region Monday. He broke his wrist Thursday. The pope left the hospital Friday afternoon and was returning to his summer home in Italy's Val d'Aosta region, spokesman Father Federico Lombardi told CNN. Doctors administered local anesthesia and put the pope's wrist in a cast, Lombardi said, adding the procedure was minor. "There is no particular reason to cause alarm," Lombardi said. The pope, 82, fell Thursday night in his room in Val d'Aosta, a mountainous region of northwestern Italy, the Vatican said. The pope arrived there Monday. The pope "tripped or slipped in his room," Lombardi said. "It was dark, in the middle of the night. It was not due to dizziness. The fact that the Holy Father waited to go to the hospital shows that it was not serious." He was taken to the hospital in the region's central town of Aosta on Friday morning after celebrating his daily private Mass, the Vatican said. Benedict's schedule for the coming days must still be confirmed, but Lombardi said he believed the pope will be able to hold his weekly Sunday Angelus from his summer home this weekend.